For a second consecutive year the Imperial War Museum's Spring Airshow took on the guise of the 'Duxford Air Festival'. A trio of contributions from the Armée de l'Air, the return to Duxford of P-47D Thunderbolt 'Nellie', formerly 'No Guts No Glory', and the UK display debut of 46 Aviation's Schlepp C-3605 were the star items on a participation list that otherwise failed to attract the attention of many enthusiasts. 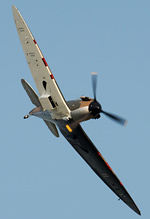 Scott Perry spent the weekend at IWM Duxford and reports for UK Airshow Review. Photography by the UKAR Staff Team. Eschewing Duxford's traditional thematic curation of displays that provided such delights as the Eagle Squadron in 2013, the Spring Airshow at Duxford has adopted a different format over the last two years. Anchoring their shows around a topic educated the audience, gave an opportunity to see diverse aircraft, to juxtapose aircraft not usually displayed together and to tell new stories about familiar aircraft, all through the informed presentation offered by Duxford's commentary team. The links between the assembled aircraft were sometimes tenuous, as the show would never be entirely populated by displays centered on the given theme, but they offered a strong core to the flying programme. The Air Festival line up lacks this coherence, it lacks a narrative driving force and an identity that has been pivotal to Duxford's successes. The Air Festival loses what is special about Duxford. It becomes just another airshow. There were few unique formation displays or pairings of aircraft, though the Harvard octet offered a welcome glimpse of what has been lost. In a display that celebrated the 80th anniversary of the type's introduction into RAF service the eight trainers were split into three elements, four flying in formation and tail-chasing to the rear of the display area, three tail-chasing closer to the crowd and the final one performing an aerobatic sequence atop the rest of the aircraft - albeit only on Sunday as the aircraft went unserviceable taxiing out on the Saturday. These are the displays that make Duxford unique and special. It's not just about what happens in the air, it is the mass taxiing of aircraft in front of you, it's the spectacle and power of the formation as they take off, the sound vibrating and echoing off of the hangars behind. The multitudinous solo displays largely failed to offer this. Despite this, Duxford's reputation as one of the UK's premier airshow venues cannot be questioned. The ability to attract items such as the Armée de l'Air's trio of the Dassault Rafale C solo display, the Extra 330SC of Equipe de Voltige and the Patrouille de France, making their only UK appearance of the season, demonstrates Duxford's international repute and attraction. 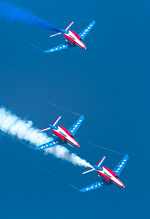 Each of the three displays offered by the air arm were very different and offered great variety to the programme; the high energy aerobatics from Equipe de Voltige providing a rare UK appearance in the team's fiftieth year. The Patrouille de France displayed only on the Sunday of the show and flew in clear blue skies, with a mix of their full and intermediate show owing to airspace restrictions - although the team did have enough height to complete their heart, which they dedicated to the Royal Air Force and its centenary celebrations. The team's entrance was also noteworthy, coming around the popular and photogenic 'bend' around the back of the AirSpace hangar… which was also utilised by the Rafale on its display run-in. 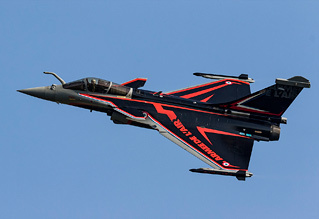 The Rafale routine was possibly one of the most anticipated of the afternoon, especially following the quality of its display at last year's Air Festival, which used the relatively small size of Duxford's airfield to great effect, producing a much more intimate encounter than sometimes offered on a larger crowd line. Unfortunately, this year's display didn't quite live up to the same standards, whether it was due to the heightened expectations after 2017, or due to a new display pilot and routine for this year, it lacked the same impact as the previous edition. That said, the display did improve over each of the three routines at Duxford (including the Friday rehearsal), so with this only being early on in Capitaine Sébastien Nativel's first season as display pilot it was good to see refinement over the weekend. Progression between the two days was a common theme over the weekend, with many of Sunday's displays feeling much closer than the Saturday routines. This was particularly noticeable with some of the warbirds, exemplified by Stu Goldspink's display in P-47D Thunderbolt 'Nellie' and within the pairs routine of the Hawker Fury MkII and Sea Fury T20, flown by Richard Grace and Brian Smith respectively. Both displays offered a much better balance to their routine on the Sunday, combining high aerobatic manoeuvres with lower and closer passes on the second outing, giving a much greater feeling of the display being conducted for the audience, affording spectators a better and closer view of the aircraft whilst still entertaining with the aerobatic sequences. 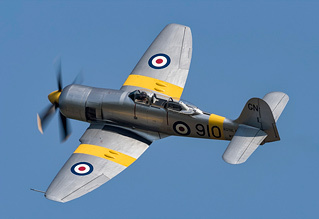 A slight disappointment was the fact that the Fury/Sea Fury duo didn't make a flypast or two with the Royal Navy Historic Flight's example, which flew a solo routine half an hour later. We've seen the RNHF example combine with other civilian aircraft in the past, so it was a real shame that it couldn't have been accomplished on this occasion. One of the real stars of the display was the very rare appearance at a UK airshow of a Farner Werke Schlepp C-3605, from 46 Aviation. The Schlepp's unusual appearance immediately caught the intrigue and attention of the crowd as it taxied out and displayed, with its manoeuvrability shown off superbly by Emiliano Del Buono. 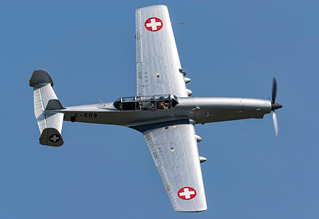 A really engaging performance in the aircraft, demonstrating the Schlepp and its attributes to the crowd, many of whom would be encountering this aircraft for the first time. Another impressive solo routine, in a more familiar machine, came at the hands of John Romain who had the responsibility of closing the display on both days. 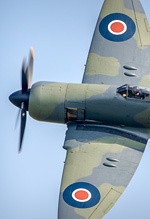 There was a noticeable whistle to his mount, IWM-owned Spitfire Ia N3200, as it was flown through the Cambridgeshire evening sun on both days. A great routine on each occasion of gentle aerobatic manoeuvres, keeping the aircraft close to the airfield with tight turns at each end. A real joy to watch pilot and aircraft in such harmony dancing through the sky. Over the two days, we were lucky with the weather - Sunday saw blue skies rather than the predicted thunderstorms, there were some very good displays from some rare UK airshow performers and, overall, it was a very enjoyable two days in the sun watching an airshow. However, it lacked the wow factor. It lacked a special ingredient. Not it terms of participation, but in terms of presentation and in terms of curation. The flying display began at 13:00, rather than Duxford's more traditional 14:00; on paper a good decision and one that should have resulted in more flying. In reality it meant there were longer breaks between items and it didn't have the usual flow a Duxford show does, with a constant stream of take offs, landings, displays; most of the time with other aircraft holding too. That wasn't present for the Air Festival. The various elements were there, but the composition wasn't quite right. The attendance for the show also felt very low walking around the site. At the M11 end of the crowdline there was only a single row of chairs along most of the fence along the jet pan; an area which is usually much more densely populated. Duxford needs to rediscover its identity for the Air Festival as, at the moment, the show feels unsure of exactly what it is.